"When a hurricane unexpectedly blows up off the coast of Nicaragua, a giant floating hotel lies in its path. With no escape for the helpless passengers and crew, it's left to Dirk Pitt and NUMA to launch a rescue and save the day. But in the storm's wake, Pitt and his team discover clues that point to an ancient mystery with shocking implications for today. As Pitt investigates further, he uncovers a plot by a mysterious billionaire called Specter to dramatically alter the Earth's climate, leaving him in control of the only solution. With foes attempting to stop him on every side, Pitt is in a race against time to prevent global catastrophe". The story opens in 1190 B.C. with a wooden horse left by Achaeans outside the fortress of Ilium, the Dardanians takes possession of wooden horse, & you know the rest of the story of how Troy fell. 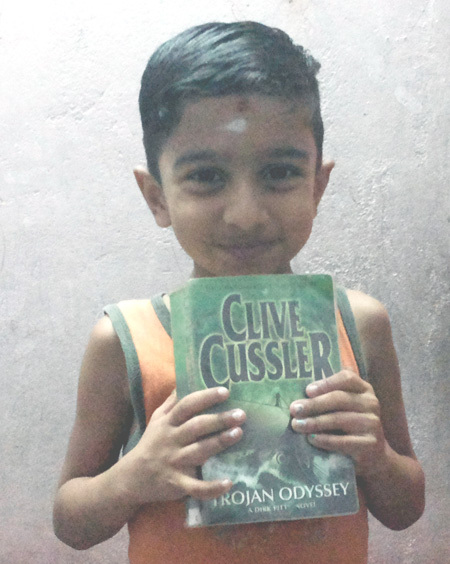 The story continues with the legendary Odysseus sail across the great green sea with the treasures of Troy. Present day a hurricane 'Lizzie' blows up off the coast of Nicaragua. Same time seventy miles northeast of the Dominican Republic in Navidad Bank, Dirk Pitt's twin children Summer and Pitt were checking the mysterious brownish contamination which had hampered the sea life in and around Nicaragua. Summer finds out a stone cave with an ancient artifact, comes to know it belongs to Celts. The odd findings of Celtic treasure near America reopens the life of Celts and the Trojan war. A new theory that Trojan war is fought by the Celts and not Greek, the war is for tin which strengthens copper. Through analysis the mysterious brownish contamination found in the ocean waters were of natural formation. Dirk Pitt and his sidekick Al Giordino after saving the floating hotel from the hurricane visits the spot and finds out that they were dumped into sea by an organization called Odyssey headed by a mysterious figure Specter. 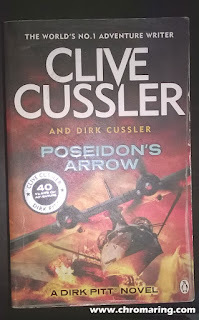 As one of the reviewer has pointed out that Dirk Pitt is culmination of James Bond and Jacques Cousteau, Dirk and Al infiltrate into the underground tunnel and comes to know that they are into an act of altering the Earth's climate and reap the riches by selling fuel cells to the World. Did Pitt save the Earth from the catastrophe? Who is the mysterious man named Specter? What happened to the treasure of Odysseus? all these are answered in the end. I enjoyed reading the book, the adventures of Dirk and Al inside the tunnel and escaping unhurt, the episode made me so nervous, Pitt's shrewdness in finding out the bomb placed in their experiment boat and capturing Rita who had killed one of his associates are worth mentioning. I smiled at the end when the author comes to the wedding of Dirk Pitt. Revealing Specter's real face made me remember the climax of 1975 MGR movie Ithayakani (Heart Fruit). In the cover it is mentioned that Clive Cussler is a Grand Master of adventure, I agree 100%. 'Revealing Specter's real face made me remember the climax of 1975 MGR movie Ithayakani (Heart Fruit)' i agree with you. Yes you are absolutely right. And thank you for your comment.